Originally published under the title "The Latest Death Threat Against Me." Imam Maulana Barkati wants me dead. He'll have to take a number. "Your throat will be slit." Glaring at me across the TV monitor, the red-bearded Mullah smirked as he delivered a death threat on India's most-watched national news network, Zee News. The remark stunned the host and the panel, who were discussing a "fatwa" against Prime Minister Narendra Modi by the very same Islamic cleric when out of nowhere Maulana Barkati made me the target of his anger. As a vocal critic of Islamism and the Muslim Brotherhood, as well as its sister organizations cultivating radical Islam across the world, I am quite accustomed to death threats, but never this direct and so public. 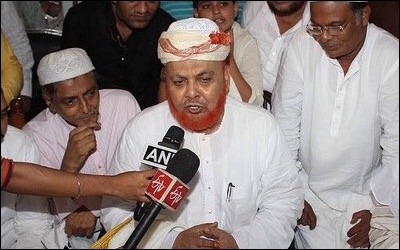 The same Islamic cleric had earlier issued a fatwa on my friend Taslima Nasreen, offering 50,000 Indian Rupees to anyone who would behead her. He is also known for organizing a funeral prayer for Osama Bin Laden in Kolkata, West Bengal. And if you believe such death threats happen only in faraway India or in the Middle East, then you are missing out on the risks ordinary Muslims take in fighting Islamists right in our backyard, across Canada. Ordinary Muslims the world over take enormous risks fighting Islamists. Nearly 10 years ago, I and a colleague were the subject of a telephonic death threat. In March 2007, a message was left on the voice mail of the secretary general of the Muslim Canadian Congress (MCC) warning that my colleague and I "cease from your campaign of smearing Islam ... I will slaughter you." An apostasy death fatwa is one of the most effective weapons that Islamists deploy to silence fellow Muslims who stand up against, and expose the Islamofascist and supremacist doctrine of radical Islamists. This threat becomes all the more alarming when ordinary Muslims fear that Islamists have their tentacles inside the state machinery as well as within security agencies and police forces. Suffice to say, nothing came of the 2007 death threat and police were more interested in the veracity of the complaint than the threat. This was not the last. The death threats keep on coming. In 2011 I woke from a surgery to remove a cancerous tumour on my spine and checked my Twitter feed. I was confronted with another death threat, this time from a teen of Somali Muslim background. She wrote, "This is an open threat to Xaar Boy @Tarek Fatah," (Xaar boy being a vulgar Somali slur). "I know where you live & and where your office is." Later she tweeted, "He was also the 1 to propose banning the Niqab in Quebec... (and he) supports homosexuality," she wrote, reiterating again: "This is an open threat. I know where you live/work @TarekFatah." Our apologists see Islamophobia as the real threat, not Islam-inspired terrorism and death threats to writers. The hospital immediately moved me to another room and contacted the police. Within hours, two police intelligence officers interrogated me for two hours. One of them I recognized by reputation – a Muslim officer who had shut down a previous investigation into a death threat against me in 2008 and another one against broadcaster Tahir Gora. Again, nothing came about and even though police identified the teenager who had threatened me, they decided she was not serious and didn't file any charges. So if the Kolkata Police don't charge Mullah Barkati, don't feel it's Third World lawlessness. We Canadians too have our apologists who see Islamophobia as the real threat, not Islam-inspired terrorism or death threats to writers.